Changelly is constantly seeking new promising cryptocurrencies to list. Day by day, we add more and more new cryptos to make your exchange experience better. Let’s introduce MakerDAO, the foundation that leverages the full potential of the crypto industry by providing collateral loans, decentralized governance and the native stable coin DAI which has been recently added to Changelly. We talked to Maker’s Head of Marketing, Coulter Mulligan (@coulterm) about the project, the industry and new horizons. Coulter helps drive education, awareness, and usage of DAI around the world. In a previous life, he held marketing roles at GoPro, Tesla, and EA. You can chat with him and the rest of the Maker team on Rocketchat. Could you tell more about the work principles of DAI stablecoin system? What provides the stability of the coin and what is the key difference from dollar-backed cryptocurrencies, like Tether which, as we know, goes ERC20 as well? Each Dai is FULLY backed by a valuable asset held in the secure Maker smart contract platform. Anyone can lock their tokens up as collateral and issue Dai against them. Unlike other stablecoin options, Dai is decentralized and lives completely on the blockchain. The price stability is maintained through an autonomous system of smart contracts, which responds to varying market dynamics. This means that Dai’s solvency does not rely on any trusted counterparties and it’s stability is unmediated by any locality. No one can alter the core mechanics of Dai, making it a safe and predictable form of money. Please give a few use cases of DAI. For example, decentralized cross-border lending can occur through the introduction of a stable cryptocurrency. This removes the problems seen with popular high volatility cryptocurrencies which creates an uncertain lending environment as borrowers and lenders cannot comfortably plan for the future. This has the potential to transform many industries including supply chain, exchanges, shipping and more. Another example is financing and financial planning. What motivated you to collaborate with Changelly? We believe in supporting platforms and new technologies like AI to provide better experiences and more efficient systems. So you are listed on Changelly. From your point of view, what goals can it help meet? The list of merchants who want to accept cryptocurrency is growing every day. What’s holding them back is the lack of a stable medium of exchange. Dai + Changelly allows merchants to accept almost any cryptocurrency and store it in Dai, which will preserve the US Dollar value of their sales and increase their customer base without decreasing accounting certainty. In general, what are your plans for Q4? We’re really looking forward to feedback on Multi-Collateral Dai, which is launching on Kovan TestNet September 17th! 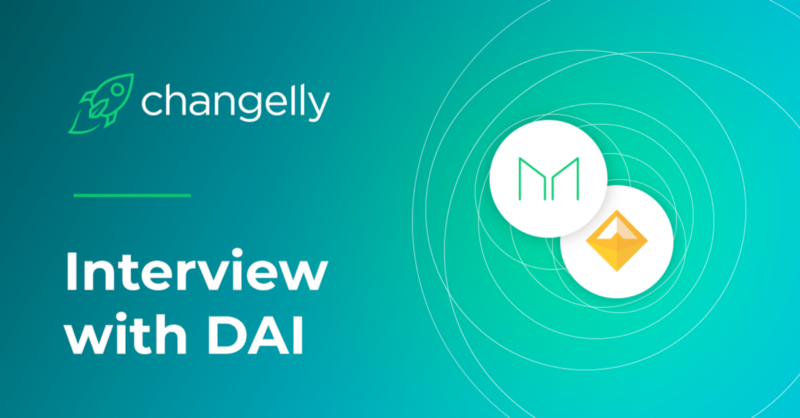 We’re focused on building out the application layer, UX, processes, and collateral partners required to deliver the complete implementation of the Dai Credit System, which we believe will be the catalyst for the next phase of the blockchain revolution. What is your vision about the global tokenization? Will it go mainstream someday? We believe that stablecoins are well on their way to unlocking the unique benefits of a modern, decentralized Internet. Their adoption will support capital market formation and usher in new applications for decentralized finance on the blockchain, which will have far-reaching impact. What should happen to the crypto industry to make it more friendly for non-tech-savvy people, including new investors? This will come with time as the market matures. We’re seeing it now in lots of new education. What would you recommend for people who are new to crypto? Be a sponge. Read whitepapers, sign up for newsletters, follow projects and influencers on Twitter. Dive into subreddits and read the differing opinions to eventually create your own. Meet-ups and events are great ways to chat with others who are interested in crypto. If you’re ever at an event with MakerDAO present, make sure you stop and say hi to us! We’d love to chat! Let’s do an interview with Changelly! Contact us at [email protected]and share your feelings about your project in the wonderful crypto space! Previous Post:How to Set Up a Bitcoin Wallet?